Mels Box of Chocolates: My 1st Knitting Project Is Finished and It's Wearable Too! 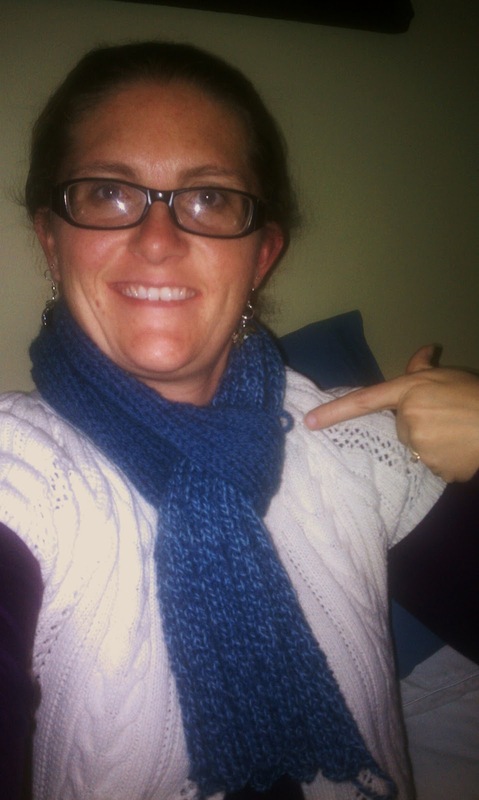 My 1st Knitting Project Is Finished and It's Wearable Too! Last Christmas my mother-in-law and sis-in-law taught me how to knit. They patiently worked with me and my clumsy fingers to teach me the garter stitch, then the purl stitch, then how to cast on, how to cast off, and even how to fix a few mistakes. I was shocked that I could really knit!! For a couple months, I knitted away. I had a little shopping bag with my project and wherever I went, the bag went. I signed up on Ravelry. I bought a pair of my own wooden circular needles. I bought my first skeins of yarn ever. For a few months, I was hoooked. Then my love of knitting fizzled. Looking back I don't know what happened really, but eventually my two bags of unfinished scarves was stuck in the corner of my bedroom behind a chair. Then came this Christmas break. Don't mind the strands at the end...I did weave them in! I knitted a real scarf. One that I can really wrap around my neck. I am so stinking proud of myself that I just had to share my success with you. So now I'm off and knitting that second scarf I had started last year. Then I guess it's back to the craft store for some new yarn for my next project whatever that may be. Hmmm, what do you knit after you knit scarves? I wonder if a hat would be too much? ?